Our furry companions make outdoor adventures so much more fun. When it comes to taking your dog on a boat are you aware and prepared for the risks? Before even you get on the water, and while you are out bobbing over waves and soaking up the sun, consider this compilation of safety tips for boating with your dog. 1. Doggy swimming lessons: Make sure your dog can swim and is comfortable doing so in a PFD-Personal Flotation Device/Pet Life Vest. 2. Pack an emergency kit: This should include a fully stocked safety kit, flares, medications that your dog may be on, a Pet ID card and vaccination record in a waterproof container. 3. 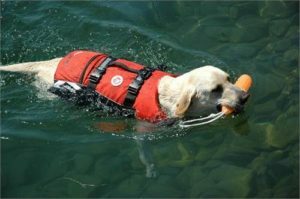 Pet life jacket: Make sure your pet’s life jacket or personal flotation device (PFD) is the proper size and fit for your dog, and that it meets all specifications and properly functions. 4. Check the law: It is important to know the laws about dogs on boats. You don’t want to ruin an outing with a ticket. 5. Familiarize your dog with the boat: Your dog’s first trip to the boat should be when it is still tethered to the dock. This is so he can explore safely and become familiar with all aspects of the boat; for example, where the bow is, the cabin and the engine. 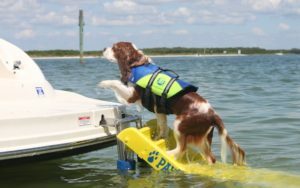 Make sure to provide a ramp for your dog to get on and off the boat safely and easily. 6. Develop a plan should your dog go overboard: You can practice this by putting your dog in the water (with his PFD of course) and letting him swim away from the boat. Cut the engine, go to your pre-designated part of the boat and call to your dog. 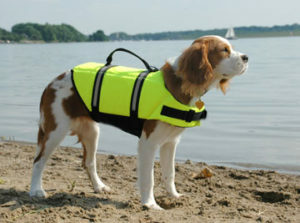 Pet life vests have handles to allow for you to easily haul your dog from the water. Now that you are well prepared for your boating trip, here are some additional tips you’ll need when you’re out on the water. 1. Keep the first trip short: A dog unfamiliar with boating should have a short first trip. This will allow him to get acclimated to his surroundings and acquire his doggy sea legs. 2. Provide plenty of water: It is important that your dog stays hydrated. Dogs can easily overheat on a boat and it is important they have constant access to fresh water. Also, provide them with shade so that they can escape the sun to cool down. 3. Sun protection: Dog skin is very sensitive. It is important to protect your pet with dog-safe sunscreen. Don’t forget to reapply on longer outings. 4. Potty breaks: Make sure to allot for potty breaks. Plan your trip and schedule stops where your dog can relieve itself.